Attendance was good for both events and, especially Bluezone hit a significant success. This week’s edition of Munich Fabric Start and Bluezone, held January 29-31 at MOC and January 29-30 at Zenith Hall respectively, closed another successful season. Although the morning of the first day started slowly, attendance was good for both events and, especially Bluezone hit a significant success. The two-day denim-focused event had been redesigned in part. Especially its main Bluezone Hall 7–for this edition renamed 'The All Star Mills'–hosted a huge long table running along the whole pavilion’s central corridor that hosted guests and exhibitors enjoying meetings, convivial moments and The Blue Supper evening closing the first day of the show. “Rising visitor numbers and an increasingly international attendance are an unmistakable indication of the broad-based acceptance Bluezone enjoys as one of the world’s most important fabric trade shows for denim and sportswear. Munich Fabric Start offers the perfect platform for in-depth business and networking with Bluezone,” said Sebastian Klinder, managing director, Munich Fabric Start. SPORTSWEAR INTERNATIONAL Talks moderated by Editor-in-Chief Sabine Kühnl interviewing trend forecaster, designer and vintage archivist Kelly Harrington. Bluezone show’s vast offer of manufacturers and service companies, and the intense program of conferences and seminars made this edition especially rich. In particular the Denim Dock area of Hall 7 hosted a series of international, high-level speakers including the SPORTSWEAR INTERNATIONAL TALKS moderated by Editor-in-Chief Sabine Kühnl interviewing trend forecaster, designer and vintage archivist Kelly Harrington, Vogue Digital’s network editor Maria Hunstig, Charles Bahr, Tubeconnect Media's founder and Gen-Z consumers. Among the others there were Tillmann Wröbel, Monsieur-T; Sue Barrett, Denim Forum; Sinem Celik, Blu Projects; Tricia Carey, Lenzing; Bart van der Woestyne, Prosperity Textile, and Jean-Pierre Inchauspe, Jeanologia. Despite the lively edition, a general mood now pervading the denim industry, including the German one, is not very optimistic. News circulating about difficult times for important companies such as Gerry Weber applying for the court order of preliminary insolvency proceedings aren’t helping either. 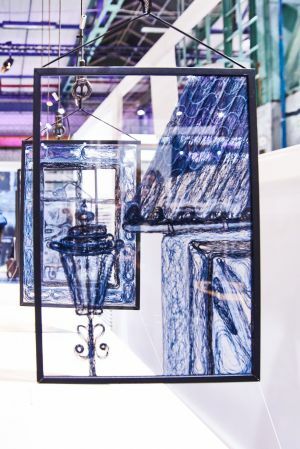 Difficulties apart, exhibitors offered a whole selection of new ideas, projects and innovative developments for s/s 2020 testifying how the industry is reacting with high energy and a positive approach. The season sees the confirmation of trends such as ’80s baggy and comfy styles, lots of patches, highly elaborate surface effects and color mixes. Pastels are cool as a wide variety of white shades. Studs, inserts of different materials in the same piece of cloth, lots of colorful prints and stripes of all widths and color mixes are also very cool. Tie-and-dye effects are also trending especially those playing with a vast variety of blue shades. Eco-friendliness is the must of the moment. Almost every company is committed in developing new technology and processes that can lower its impact on the environment. Candiani Denim introduced Relast, its new GOTS and GRS approved denim line. Among them, Candiani Denim has introduced Relast, its new GOTS and GRS approved denim line that uses Roica premium stretch yarns developed in cooperation with Asahi Kasei, a leader in premium stretch. It presented a variety of different looks–from street and sport minded to cool-chic. Among the innovation shown it also offered its new KN-Cotton, a line of fabrics using Earth Colors by Archroma, an exclusive dyestuff made from recycled cotton scraps, and dyed with N-Denim technology. Invista, owner of the Lycra brand, announced the launch of its new patented Lycra Freef!t technology for denim in Germany at Bluezone. This technology provides denim and woven fabrics with soft, easy stretch and excellent recovery. Denim fabrics with Lycra Freef!t technology are less compressive on the body than standard stretch denim. Lower compression allows for greater comfort and freedom of movement, an area of significant interest to consumers. Lycra has also announced that its Lycra fiber Type 166L has earned a Gold Level Material Health Certificate. The certificate is awarded by the Cradle to Cradle Products Innovation Institute to products that meet the Material Health requirements of the organization’s Product Standard and is valid for two years. This fiber is also employed for denims that incorporate the newly launched Lycra Freef!t Technology. Italian specialised finisher and laundry Fimatex partnered with Myr and presented a series of innovative finishes and treatments. A recent partnership was also announced between denim guru Adriano Goldschmied, global denim manufacturer Vicunha Textil and Myr, innovative software directed at fashion design insiders that can develop customization of denim pieces through a 100% digital platform. As part of the collaboration, every month Goldschmied will introduce six items made of Vicunha materials customized with the Myr software. The aim of the operation is to show how thanks to this tool designing and customizing denim pieces can be optimized while saving resources and costs without sacrificing creativity and efficiency. Italian specialised finisher and laundry Fimatex also partnered with Myr and presented a series of innovative finishes and treatments. This area focused on innovative solutions and strongly focused on eco-friendly projects. For the occasion the new Planet Rehab partnership debuted. This capsule collection has involved Guatemalan designer Juan Carlos Gordillo (also see: https://www.sportswear-international.com/galleries/fashion/Juan-Carlos-Gordillos-take-on-denim--1728), Tencel and Tencel x Refibra branded Lyocell employed for Tejidos Royo fabrics. The fabrics were dyed using Recycrom, an ecofriendly technology from Officina+39. The resulting garments were finished with Tonello low-impact washing machines and technology. The aim of Planet Rehab collection was to illustrate that fashion can be both responsible and beautiful when involving specialists of the supply chain who care for the environment. A special series of fibers and materials now in the experimental phase were presented in this same pavilion. Among them there were special material obtained by growing plant roots to create special multi-strata unique textures and shapes. Tanja Maria Nitsche presented special plant-based bioplastics that can be laser cut and added with other materials such as recycled paper and other fibers. Within Munich Fabric Start’s main pavilion Tintex presented many eco-friendly fabrics. Among them there was a material made with 80% organic cotton and 20% Seacell, a fiber obtained from seaweeds. Another special sweatshirt material was made with organic cotton CottonX, a branded cotton added with copper ions that is not harmful for those who wear it and guarantees antibacterial properties, and V55 Roica elastane, a Cradle-To-Cradle degradable fiber. Other stretch jerseys on offer were made without any stretch fibers, but only using naturally mechanical stretching properties of the cotton fiber. Among the winners of the MFS’ Hitex Award, the show’s special jury also chose a new fabric by denim specialist Soorty Enterprises. The company won second place in the contest presenting Rain Shield, an extremely lightweight, recycled and water-repellent denim in a Tencel/nylon blend. In addition to its fast-drying finish, water-repellent, thermal insulating and shape retention properties, this elegant looking denim boasts a super soft hand and is finished with a discreet shine.